Are you looking for a career in scaffolding? A recent survey of online jobs revealed that a STAGGERING 92% of scaffolding positions require a MINIMUM of intermediate level entry, with most of the 'fly-in/fly-out' positions requiring advanced certification. The Australian Government has introduced the new licensing system to make training and assessment of high risk work nationally consistent. This has increased the duration of courses and therefore the costs. Get your scaffolding licence and start working in the building, construction, mining, industrial, marine, and staging industries. 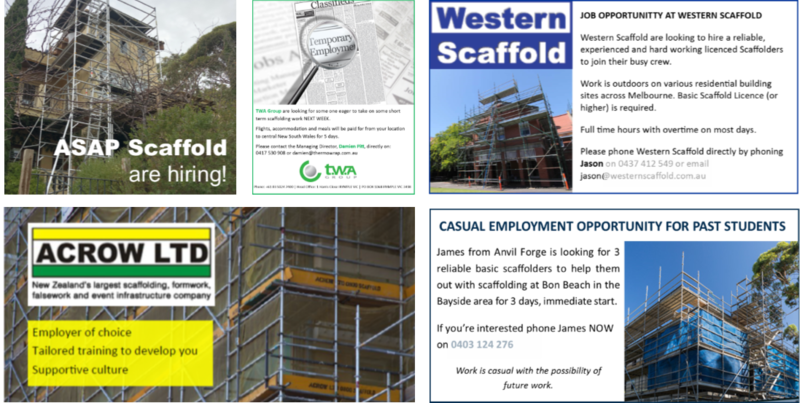 Connect to our The Scaffold Tool & Training Company's Facebook page. On occasion, companies will ask us if we have recently qualified students looking for work. We advertise available positions on our Facebook page and contact students who have completed their training in the last 12 months. Are you an employer looking for a qualified scaffolder? Contact The Scaffold Tool & Training Company if you require a qualified scaffolder to join your workforce. An e-mail will be sent to students who have completed their training within the last 12 months and are looking for work. Provide as much detail as you can. The position is included on our Facebook page and associated groups.